As part of a recent TV Reviewer Workshop hosted by LG, a number of AV journalists were invited to tour one of Netflix's Hollywood-based studios--specifically, Sunset Bronson Studios. In the interest of full disclosure, LG arranged the tour to reinforce its growing presence on the production side of the AV experience. (The day also included a tour of Technicolor, which I wrote about a few weeks ago. 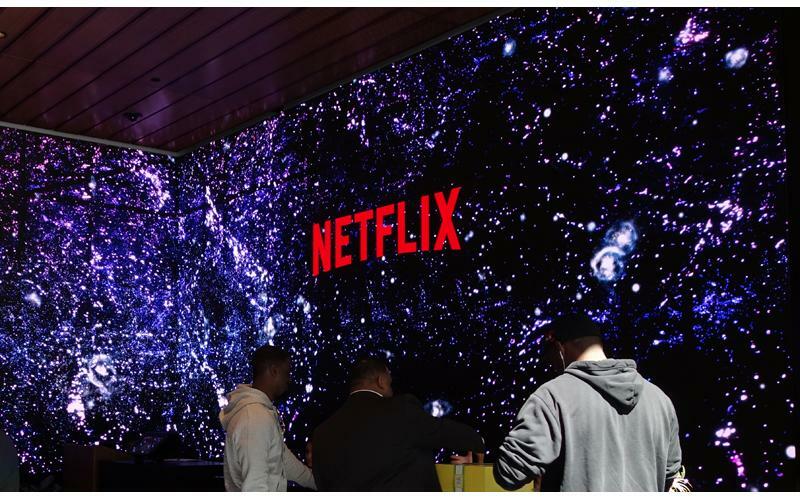 The focus of the event, though, was to visit Netflix's AV Lab, which exists to help filmmakers make the best use of advanced technologies like HDR and Atmos in Netflix's original programming. 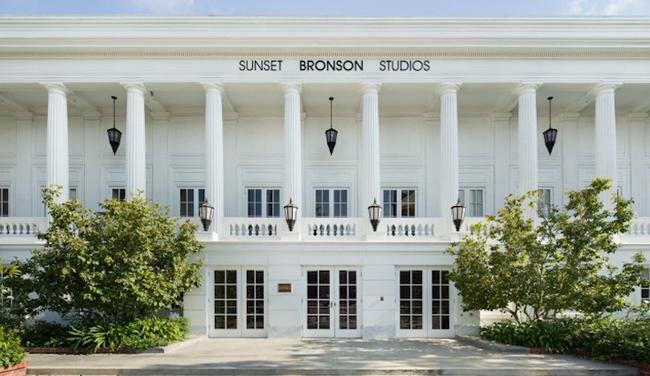 Located on an 11-acre campus in the heart of Hollywood, Sunset Bronson Studios is the site of the original Warner Bros. Studios where the first talkie, The Jazz Singer, was filmed. The studio now serves as Netflix's L.A. base of operations (the corporate office is located in Los Gatos in northern California). Netflix has steadily expanded its presence on the lot and now occupies roughly 560,000 square feet of production stages and office space. Netflix original shows like The Ranch and the upcoming Alexa & Katie are filmed here. Netflix currently occupies an interesting space in the home entertainment market. We all know that the company began as a content distributor, first through disc rentals and then through the streaming of movies and TV shows created by other studios. After becoming the king of subscription-based video streaming, the company decided to further strengthen its position by developing its own original content and has enjoyed critical and commercial success with shows like House of Cards, Orange Is the New Black, 13 Reasons Why, and Stranger Things. Because Netflix essentially controls its programming chain from creation to distribution, the company can have a lot more influence over the AV quality of the final product--compared with, say, a network like ABC that acquires much of its content from different studios and is somewhat at the mercy of broadcasters to dictate the AV experience. Netflix has been on the cutting edge when it comes to delivering the hottest new AV technologies to the home environment; the service currently offers over 1,700 hours of 4K content and over 300 hours of HDR content, with support for both HDR10 and Dolby Vision. Last year, Netflix added support for Dolby Atmos soundtracks; right now there are 15 Netflix titles with Atmos soundtracks, and more are coming this year. Perhaps control wasn't the best word to use in the previous paragraph, as it suggests some type of mandate that all Netflix content has to meet certain specs. Manager of Production Engineering Jimmy Fusil was quick to point out during our tour that Netflix doesn't force filmmakers to embrace High Dynamic Range or 3D audio. While there is certainly a big push to make use of these technologies, they don't have to be implemented if they don't serve the greater good of a particular show. One of my favorite Netflix original shows is Grace & Frankie, which just rolled out season three with no HDR or Atmos--and that's just fine, because the show really doesn't need it. However, when we're talking about highly stylized shows like Stranger Things and Altered Carbon, HDR video and Atmos sound are perfect complements to help engage viewers on a deeper level. And the mission of the AV Lab is to help the filmmakers who want to embrace these new and somewhat confusing technological waters--to help them make informed choices and evaluate how those choices will play out in the user's living room. The team's involvement begins at the very start of the production process, even in helping to evaluate and select the right cameras for the job. The AV Lab consists of a several different, creatively named rooms, and the Holodeck is where you'll find a variety of 4K cameras, video processing equipment, and monitors being evaluated. The team will test a certain camera's color, resolution, and dynamic range in order to make recommendations. The largest room is called Black Mirror, and it mimics a true mastering environment with a more theater-esque AV array: a full Atmos speaker array and a projection-based system with a Barco projector and Stewart Filmscreen screen. In this space they can, as they describe it, "investigate the production workflow and collaborate with the production team" to get the best AV results. Meanwhile, in a smaller room called Mute (shown right), we find an AV setup designed to more closely replicate what you'll find in the consumer's home so that the team can evaluate how the content will look and sound in the real-world environment. 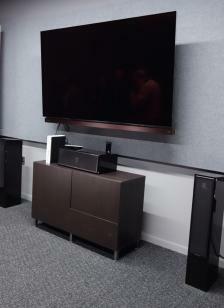 Here's where an LG OLED TV resides, mated on our particular tour day with a MartinLogan multichannel speaker system. They actually use a variety of different components from different manufacturers in this space to perform quality control tests. Finally, we paid a visit to the Audio Lab (shown below), a recent addition to the AV Lab that allows the team to listen to and experiment with Atmos soundtracks and their respective downmixes. The room was calibrated by Dolby and features a 9.1.6 speaker system using JBL 708P/705P active studio monitors and a JBL sub. We had some fun listening to a couple different audio mixes: one was a scene from Jessica Jones that had been upmixed from 5.1 to Atmos, and the other was a native Atmos mix from Altered Carbon. It was pretty interesting to watch the computer representation of Atmos effects and how they bounce around the soundfield; the native Altered Carbon mix made some really aggressive and creative use of the height channels. Given Netflix's streaming model in which these new shows will presumably be available to watch (and watch often) for years down the road, the AV Lab team wants to make sure that today's original programming will still look and sound great on tomorrow's AV systems. Atmos may only appeal to a small audience right now and have limited channel applications, but the general philosophy seems to be that it's better to create a more ambitious Atmos soundtrack now and downmix it than to be conservative and need to upmix it later on. Likewise, Dolby Vision content is stored at its maximum quality and usually mastered at 4,000 nits, even though today's TVs can't get that bright. In a few years, the TVs will get that bright, and Netflix wants its content to stand the test of time, both creatively and technologically. Of course, the reality is that, right now, many people who are streaming Netflix aren't equipped to enjoy these advanced AV technologies and perhaps don't even care about them. They may not own an HDR-capable TV, and it's even less likely that they have an Atmos speaker setup. Then there's the whole issue of bandwidth limitations that hinder the quality at the end of the chain. Still, for enthusiasts like us who do care, I say kudos to Netflix and the AV Lab for doing their part to deliver us high-quality, cutting-edge TV content even in a streaming package. • What I Learned During My Trip to Technicolor at HomeTheaterReview.com. • Looking for 4K Content? Here Is What's Available Right Now at HomeTheaterReview.com.